pairToBed compares each end of a BEDPE feature or a paired-end BAM alignment to a feature file in search of overlaps. NOTE: pairToBed requires that the BAM file is sorted/grouped by the read name. This allows pairToBed to extract correct alignment coordinates for each end based on their respective CIGAR strings. It also assumes that the alignments for a given pair come in groups of twos. There is not yet a standard method for reporting multiple alignments using BAM. pairToBed will fail if an aligner does not report alignments in pairs. -a BEDPE file A. Each feature in A is compared to B in search of overlaps. Use “stdin” if passing A with a UNIX pipe. Output will be in BEDPE format. -b BED file B. Use “stdin” if passing B with a UNIX pipe. -ubam Write uncompressed BAM output. The default is write compressed BAM output. -ed Use BAM total edit distance (NM tag) for BEDPE score. Default for BEDPE is to use the minimum of the two mapping qualities for the pair. When -ed is used the total edit distance from the two mates is reported as the score. -s Force “strandedness”. That is, only report hits in B that overlap A on the same strand. By default, overlaps are reported without respect to strand. either- Report overlaps if either end of A overlaps B.
neither- Report A if neither end of A overlaps B.
xor- Report overlaps if one and only one end of A overlaps B.
both- Report overlaps if both ends of A overlap B.
notboth- Report overlaps if neither end or one and only one end of A overlap B.
ispan- Report overlaps between [end1, start2] of A and B. Note: If chrom1 <> chrom2, entry is ignored. ospan- Report overlaps between [start1, end2] of A and B.
notispan- Report A if ispan of A doesn’t overlap B. - Note: If chrom1 <> chrom2, entry is ignored. notospan- Report A if ospan of A doesn’t overlap B. - Note: If chrom1 <> chrom2, entry is ignored. By default, a BEDPE / BAM feature will be reported if either end overlaps a feature in the BED file. In the example below, the left end of the pair overlaps B yet the right end does not. Thus, BEDPE/ BAM A is reported since the default is to report A if either end overlaps B. Default: Report A if either end overlaps B. Using then -type option, pairToBed provides several other overlap requirements for controlling how overlaps between BEDPE/BAM A and BED B are reported. The examples below illustrate how each option behaves. -type both: Report A only if both ends overlap B. -type xor: Report A only if one and only one end overlaps B. -type notboth: Report A only if neither end or one and only one end overlaps B. Thus “notboth” includes what would be reported by “neither” and by “xor”. -type ispan: Report A if it’s “inner span” overlaps B. Applicable only to intra-chromosomal features. -type ospan: Report A if it’s “outer span” overlaps B. Applicable only to intra-chromosomal features. -type notispan: Report A only if it’s “inner span” does not overlap B. Applicable only to intrachromosomal features. -type notospan: Report A if it’s “outer span” overlaps B. Applicable only to intra-chromosomal features. 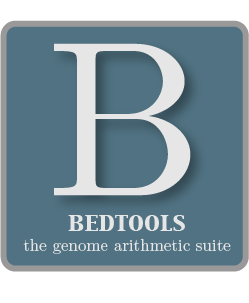 By default, pairToBed will report an overlap between A and B so long as there is at least one base pair is overlapping on either end. Yet sometimes you may want to restrict reported overlaps between A and B to cases where the feature in B overlaps at least X% (e.g. 50%) of A. The ?Cf option does exactly this. The -f option may also be combined with the -type option for additional control. For example, combining -f 0.50 with -type both requires that both ends of A have at least 50% overlap with a feature in B. For example, report A only at least 50% of one of the two ends is overlapped by B. By default, pairToBed will report overlaps between features even if the features are on opposing strands. However, if strand information is present in both files and the “-s” option is used, overlaps will only be reported when features are on the same strand. When comparing paired alignments in BAM format (-abam) to features in BED format (-b), pairToBed will , by default, write the output in BAM format. That is, each alignment in the BAM file that meets the user’s criteria will be written (to standard output) in BAM format. This serves as a mechanism to create subsets of BAM alignments are of biological interest, etc. Note that both alignments for each aligned pair will be written to the BAM output. When comparing paired alignments in BAM format (-abam) to features in BED format (-b), pairToBed will optionally write the output in BEDPE format. That is, each alignment in the BAM file is converted to a 10 column BEDPE feature and if overlaps are found (or not) based on the user’s criteria, the BAM alignment will be reported in BEDPE format. The BEDPE “name” field is comprised of the RNAME field in the BAM alignment. The “score” field is the mapping quality score from the BAM alignment.